This summer, one of my guests asked to have her breakfast at 9AM. She was easy going and said for me to make whatever inspired me. With fresh picked garden herbs and greens, my neighbor’s grass raised organic eggs, and local grass raised organic cheddar cheese, I decided to make her an omelet. First I chopped and sautéed a little onion, added sea salt and fresh ground black pepper. Let it cook slowly. I picked some fresh thyme and marjoram. Then I chopped them up with the chard and put them on top of the frying onions. After a couple of minutes when the greens turned bright green, I poured the eggs on top. Still no sign of my guest. I turned off the heat. Decorated the eggs with thin slices of cheese, and, covered the skillet. The omelet cooked slowly from the residual heat. Perfection! A new recipe, cooking method, a slow cooked omelet was born. No need to flip it. Easy. Pictured above is the meal my guest came down to at 9:20 AM. 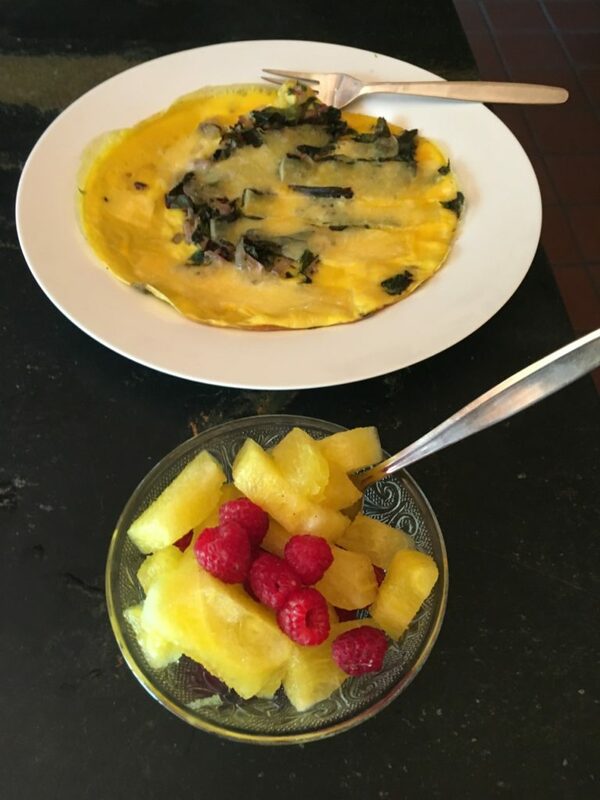 A fresh fruit salad with yellow watermelon and fresh picked raspberries, and a warm vegetable and cheese omelet, a lovely breakfast. Since then, I’ve made lots of delicious omelet variations. Slow cooking, relaxed, peaceful, present, mindful, and confident. Varying the vegetables, herbs, cheeses, and sometimes, adding pesto. Always, turning off the heat when adding the eggs and cheese. Slow cooking makes a luscious meal. Tenderizes flavor. Adds peace. By the way, my guest loved the breakfast and also loved being introduced to sweet organic yellow watermelon. Coming from city, she enjoyed her stay with me and went home refreshed, nourished and relaxed. Come for a relax and recharge organic b&B experience. Enjoy organic farm to table vegetarian meals. Depending on the season, you can take a hike on trails out the back door. Bike for miles, swim in clean ponds, or ski on miles of trails. Come visit. Please email me leslie@lesliecerier.com for more info and dates available. Gourmet Getaway Weekends and weekdays, too. Please contact me leslie@lesliecerier.com for more info and dates available.